I've been looking without success for a local art class for Matilda, the ones available are all within private membership clubs or with a waiting list as long as your arm. Then the other week I happened to notice that a friend Lala Thorpe who runs a very successful children's art club in Islington was coming over this way to Battersea. In a blink of an eye I'd signed up Matilda for a 2 hour workshop which we've been looking forward to ever since! Lala is a highly respected Arts project co ordinator and fully qualified art teacher. We first met about 20 years ago when she was working with my university friend for Artangel. Her art club in Islington looks like enormous fun with trips to galleries part of the curriculum, sadly it's just too far for me to take Matilda to every Saturday morning, so I'm hoping Artescape will set up a permanent home at the Doodle Bar too! 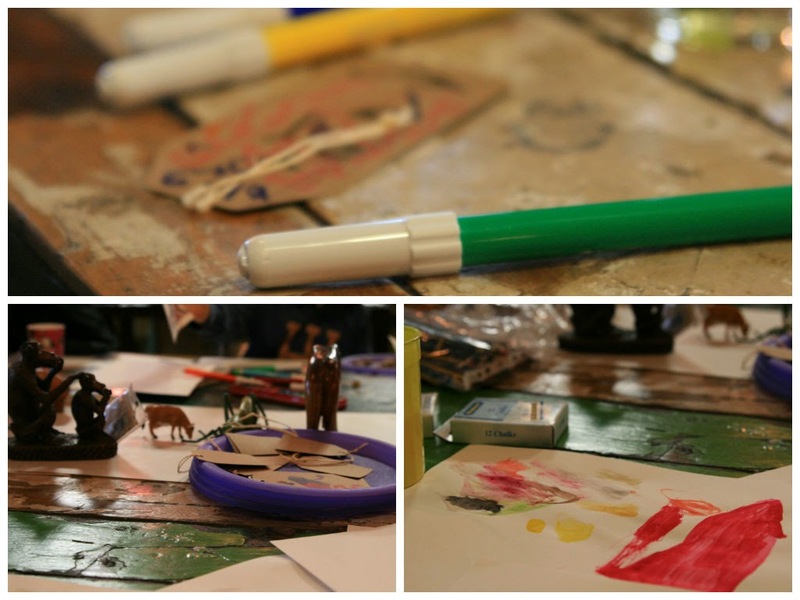 We spent a couple of hours yesterday morning painting, block printing, drawing and making. There are plenty of materials, advice and suggestions. Children are encouraged to get messy and creative whilst trying out different techniques and materials. Lala and Eva have a wonderful energy about them, and are clearly passionate about nurturing a love of art in all the children they teach. Their belief that art facilitates a child's comprehension of the world that surrounds them supports my own vision; learning and development is more successful, in my view, by allowing children to be children, to explore and experience a wide range of activities. We'll definitely be returning to this inspirational space too. The Doodle bar is a fabulous space right on the river in Battersea, who knew that this existed?! It's my kind of hang out place and I have every intention to go back one evening for a cocktail, if their excellent coffee is anything to go by, I'll be having more than one! It is also the perfect location for Artescape with its industrial vintage interiors, and massive blackboard wall and columns that the children are welcome to decorate with their chalk drawings. Ladies we can't wait to return! Can you be persuaded to start some workshops for adults too? Perhaps over a cocktail and some streetfood from next door?